If you’ve been to Taiwan, you’ll know that one of the snacks the country is well-known for is its Jiu Fen Taro Balls. Sold along the streets of bustling Jiu Fen, these coloured balls are chewy and are served alongside other ingredients such as sweet potato and green tea balls, in red bean, green bean or sweet potato soup. 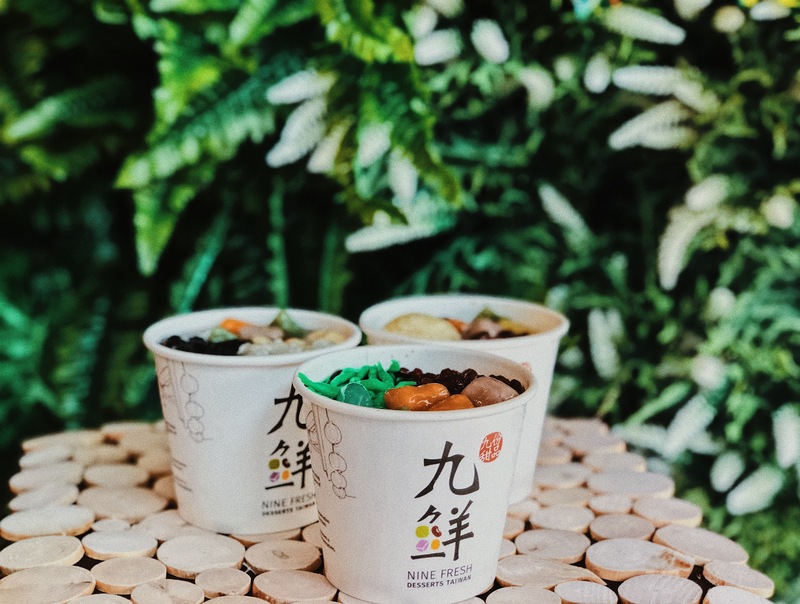 A party of flavours and textures, if you’re a fan of these dessert bowls and are a strong believer that ‘the more the toppings, the better‘, you’ll love Nine Fresh‘s local spin on the Taiwanese classic. If this is the first time you’re hearing of Nine Fresh, you’re missing out! Nine Fresh is a dessert stop that has been serving up quality cups of the delicious dessert for almost 5 years now. 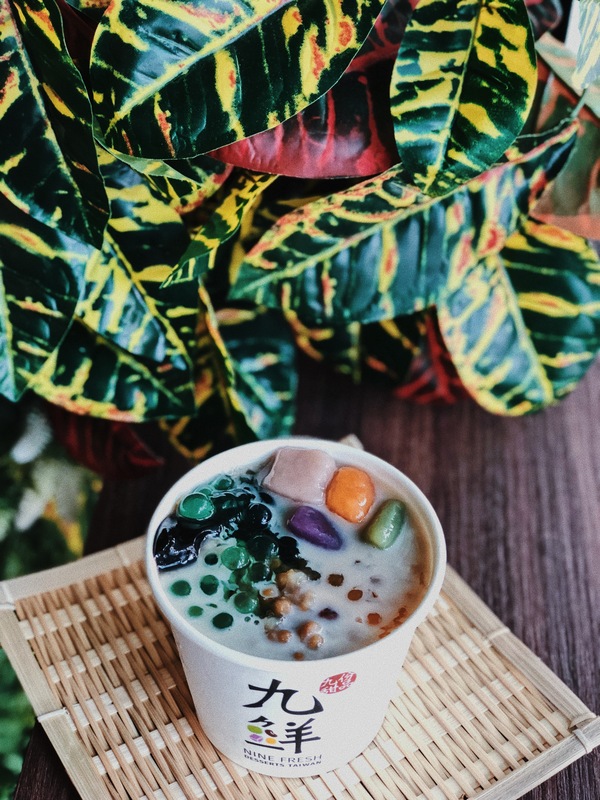 That is, cups of grass jelly, beancurd, or ai-yu jelly (or a mixture of the three) heaped with beans (red bean, green bean, pinto bean, eight treasure bean), balls (mini taro ball, taro ball, durian ball), flavoured pearl jelly (aloe vera, mango, lychee, passionfruit), black pearls, and many more toppings. At Nine Fresh, they’re all about keeping traditions fresh, and recently, they’ve done exactly that by rolling out 2 new series of desserts. 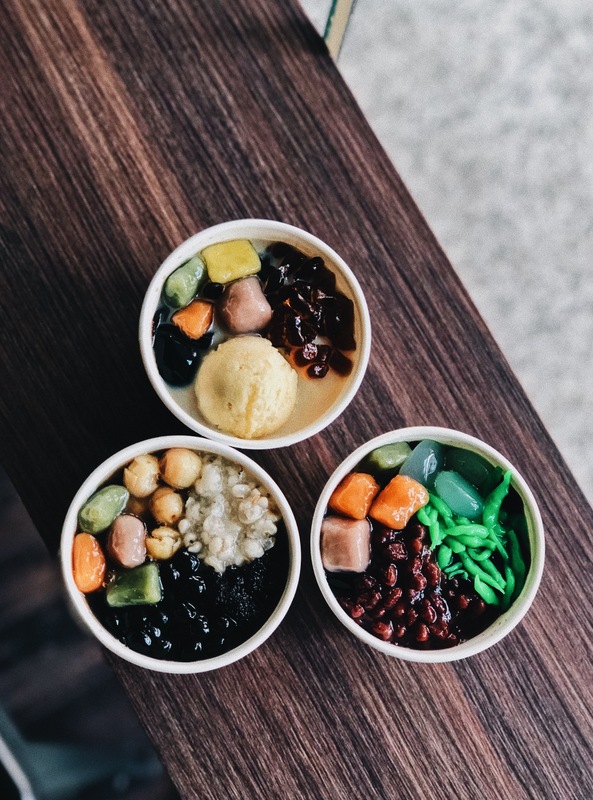 The first is its Local Flavours series, which consist of dessert creations inspired by some of our favourite local desserts, including Chendol and Cheng Teng. The Chendol Cup ($3.80) has a grass jelly base and is topped with green chendol jelly, attap seeds, red bean, and taro balls. With (almost) all the ingredients you’d typically find in a chendol dessert, this is a far less sweet variant of the coconut milk-heavy dessert. The Cheng Teng Cup ($3.80) also has all the good stuff you’d find in the traditional dessert: pong tai hai, lotus nut, barley, and sago. These are served over a wobbly ai-yu jelly base. And of course, you can’t forget the taro balls! 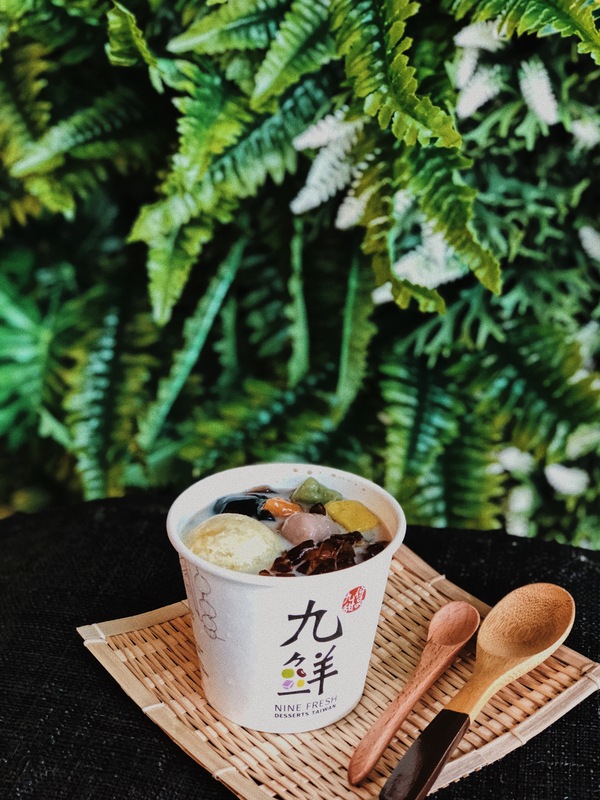 As durian lovers, our favourite is the Durian Yin-Yang, a half beancurd, half grass jelly base that’s topped with black sugar jelly dice, taro balls, and a generous scoop of rich durian puree – yes, actual durian flesh. The flavourful and creamy durian, combined with the array of chewy and QQ ingredients in the cup make it a winner – and all for just $3.90. Another exciting addition to Nine Fresh’s offerings is the Fanspiration Series, a bunch of cups and flavours that are essentially customer-generated. 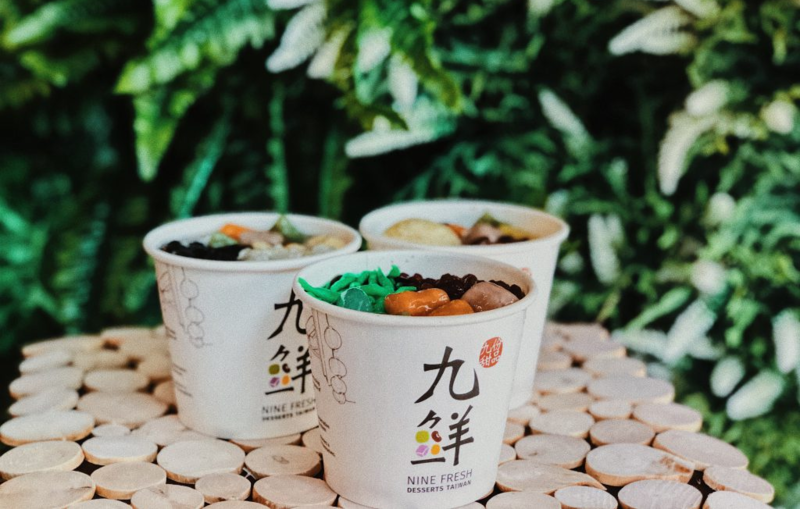 The best-selling flavour and ingredient combinations based on Nine Fresh’s data, gathered from its create-your-own-cup promo this year, you can’t go wrong with these flavours that are beloved by many, many Singaporeans. Some of these items in this series include the all-black The Black Cup ($2.90), the all-white The White Cup ($2.60), and The Yin-Yang Cup ($2.90), which is half black and half white – at least when it comes to the base. If you simply can’t decide between the bases (or love them all equally), the Aww In One Cup cup contains all three of them. This cup comes piled with black pearls, taro balls, and mini taro balls on top. If you’re a first timer to Nine Fresh, we suggest you go for this so you can sample a little bit of everything and figure out which you prefer! From there on, you can customise your own cup and create your own perfect combination of ingredients. With so many decadent desserts out there, from rich chocolate treats to lava toasts, Nine Fresh is – literally – a refreshing change from the lot. 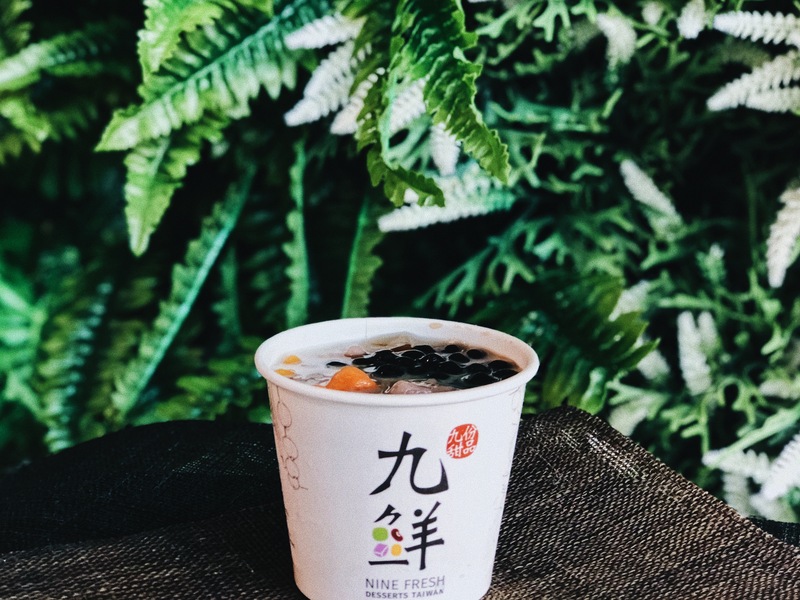 Priced very affordable from $2 to $3.90 for one of their pre-set cups, Nine Fresh’s desserts are a lighter option with so much to offer in the way of taste and flavour! The next time you’re craving a refreshing dessert, make sure to pop by one of Nine Fresh’s 16 outlets – you won’t be disappointed!